Artistic roller skating is a sport similar to Figure Skating but where competitors wear roller skates instead of ice skates. Performances are usually done on quad skates, but inline skates can also be used. Events are made to cater for age and ability or experience. Figures are movements made of at least two circles, but should not be more than three. It involves primary and secondary movements without turns. Events include solo dance, duo dance, teams, trio dance. The participants are assessed by their accuracy of their steps when performing a dance. There is also a freestyle event in which creativity is emphasized. It consists of jumps, spins, and moves and is accompanied by music. A team can create different types of moves to the music. Some styles used are skating in a line, skating in a box, splicing, and skating in a circle. 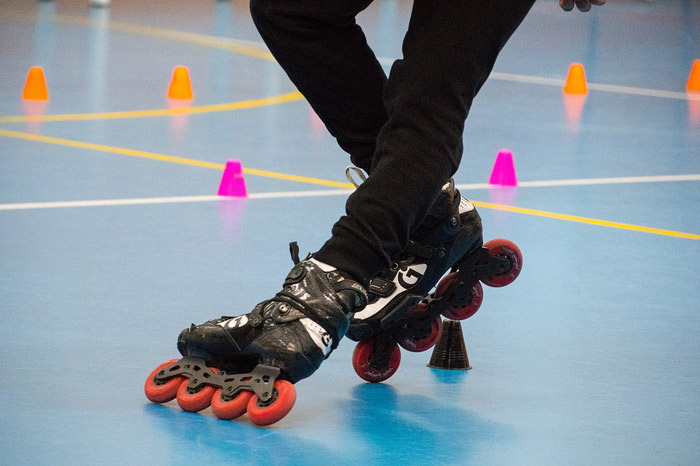 Roller Hockey — includes traditional roller hockey (quad hockey or rink hockey played with quad stakes) and inline hockey (played with inline skates). Figure Skating — an artistic ice skating sport where athletes perform routines on an ice rink. Includes the disciplines of Ice Dancing and Synchronized Skating.